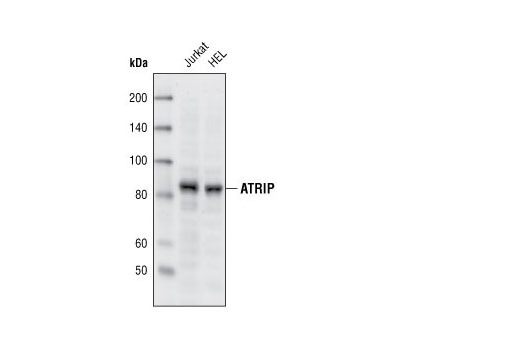 Western blot analysis of extracts from Jurkat and HEL cells using ATRIP Antibody. 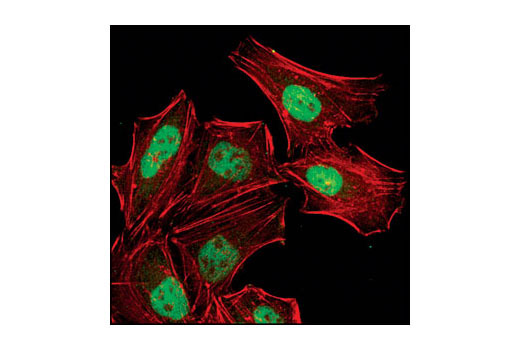 Confocal immunofluorescent analysis of HeLa cells using ATRIP Antibody (green). Actin filaments have been labeled with Alexa Fluor®555 phalloidin (red). (isoforms 1, 2, and 3). Polyclonal antibodies are produced by immunizing animals with a synthetic peptide corresponding to amino acids surrounding Gly267 of human ATRIP. Antibodies are purified by protein A and peptide affinity chromatography. In response to genomic stress, the ATR interacting protein (ATRIP) binds and is phosphorylated by the DNA damage-and checkpoint-activated kinase ATR (ataxia-telangiectasia mutated and rad3-related). Both ATR and ATRIP are integral for checkpoint signaling and are critical in the DNA repair response (1-3). Direct interaction between ATRIP and replication protein A (RPA) at RPA-coated, single-stranded DNA results in the recruitment of phosphorylated ATR/ATRIP to stalled replication forks and sites of DNA damage (3). ATR/ATRIP coordinate DNA repair and cell cycle progression in conjunction with key regulatory proteins, such as Rad17 and the 9-1-1 complex (4). ATR associated with ATRIP can also be stimulated by topoisomerase II binding protein (TOPBP1), suggesting that ATRIP may regulate both ATR localization and activity (5). Cortez, D. et al. (2001) Science 294 (5547), 1713-1716. Itakura, E. et al. (2004) Biochem. Biophys. Res. Commun. 323, 1197-1202. Zou, L. and Elledge, S.J. (2003) Science 300, 1542-8. Yang, X.H. and Zou, L. (2006) Methods Enzymol. 409, 118-131. Ball, H.L. et al. (2007) Mol Cell Biol 27, 3367-77.